A crate is your dog’s own personal den where he or she can escape from the goings on of the household and feel safe and secure (and not shred your house when you are not watching!) Crate training uses a dog’s natural instincts as a den animal. The main use for a crate initially is house training. Dogs don’t like to soil their dens. The crate can limit access to the rest of the house while he learns other rules too, like not to chew on furniture. Never use the crate as a punishment. Your dog will come to fear it and refuse to enter it. Young puppies shouldn’t stay in a crate for more than three or four hours at a time as they can’t control their bladders and bowels for longer. Crate your puppy only until you can trust him not to destroy the house and mess inside. After that, it should be a place he goes voluntarily and the door can be left open. Crates can be collapsible metal or moulded plastic. The metal crates offer better ventilation and are easy to carry around. The plastic crates are cozier but not as portable. Choose a size large enough for your puppy to stand and turn around in as an adult. Block off the extra crate space to prevent him using the other end as a toilet while he or she is little. Make a comfortable bed in the crate and place it in a spot where your puppy can see you come and go. Play with your puppy outside, make sure he has been to the toilet, then put him in the crate with a chew and close the door. Walk away and ignore any crying or whining. After a short while your puppy will fall asleep. Listen for signs that he is waking up and immediately pick him up and take him outside. If you just open the crate door and allow him to walk out, he will wee just outside the door of the crate. You can put your puppy in the crate whenever you cannot watch him as long as you have taken him outside first. As your puppy matures and gets used to his crate, you can leave him in the crate for short periods when you need to go out. Don’t have a long drawn out goodbye; just pop him in the crate and leave. When you come back, act very matter of fact, don’t have a big reunion, just take him straight outside to the loo. If you make a big fuss you will increase his anxiety about being left alone. If you work during the day and have to leave your puppy for long periods, put his crate in an enclosed area e.g. a cordoned off part of the kitchen, an enclosed yard or a bathroom. Leave the door open and cover the rest of the area with newspaper. Your puppy will go into his crate to sleep. You take him outside before you put him in the crate and make sure he has relieved himself. You do not put a water bowl in the crate. If your puppy should have an accident, do not punish him just clean out the crate with non ammonia based cleaner. I have crate trained my last two GSD puppies and have found the crate to be the single most useful training tool I have ever used. I take my pups to work with me when they are little so I found it best to have a crate next to my desk at work and another next to my bed at home. If your house is large or double storied, you can have crates in more than one location. The fold up metal crates are quick to fold up and can be carried from room to room. They are also perfect to transport your puppy in the car. Within a week, I found my pups would happily go into their crate whenever they wanted to snooze or when they knew I was on my way out. By the time my pups were 10 weeks old, I could leave them in the crate for a few hours to go out in the evening. I would come back to find them fast asleep. No messes in the house, ever. Whenever my pups were outside the crate, they were on lead. After a few weeks, the lead was left trailing. Only once the pups were 5 months old, did I remove the lead. I “turfed” my older dog out of his crate at the age of 2 when the next puppy came along. I no longer use the crate once my pups grew up (although some dogs will happily sleep in them for their whole lives with the door left open.) When left alone, my dogs don’t mess in the house, destroy anything, howl or bark. They happily get into the cage at the vet and while in the car, they don’t pace or bark, just lie down or sit quietly. All of this great behaviour I put down to crate training. A while back, one of my older dogs was ill and as a result needed to go outside at least twice during the night. If I didn’t hear him trying to wake me, he’d creep downstairs and I’d wake up to find a puddle. I put his old crate next to my bed and straight away he jumped right in. Now he sleeps through the night in his crate and I have no more puddles to clean up. You have trained Solo the Standard Poodle as a puppy. (The girl with the frock and the brown standard poodle puppy) I am urgently looking for a plastic crate for Solo now 6 years old. The crate should be extra large and should comply with airline rules, overseas trip. Your help will be appreciated. Try Sharbara Trading – they may be able to help. I don’t have a crate available to rent unless your dog is very tiny. Contact trion@telkomsa.net. Trish might be able to help you. Hi I have a bordercollie X australian shepherd puppy who is just 7 weeks old from the SPCA. 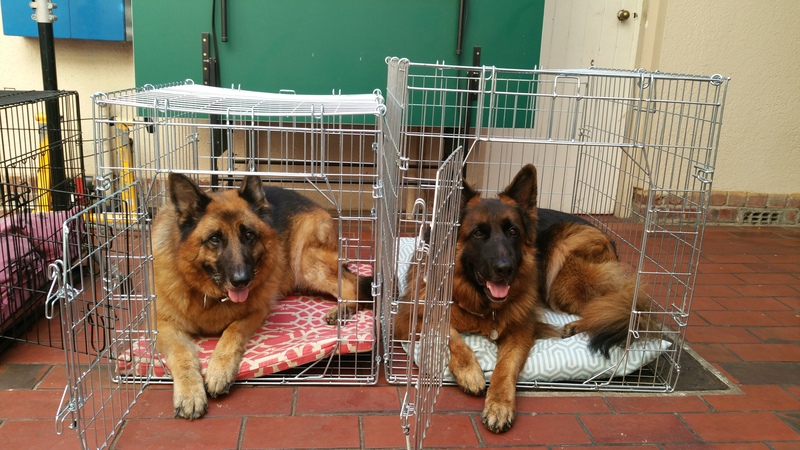 I also have three other dogs – 2 small and a German Shepherd (8 years old). 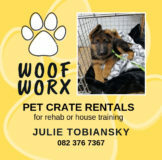 Im interested in getting a crate for the puppy especially to start house training asap. Can you let me know where I can view or buy them. Id need some advice about size. We have stock at the club in Pinelands – you can come and have a look on Saturday afternoon. The only size missing is large which would ideally be the right size if you plan to use the crate until adulthood. If not, a medium would be perfect. (the larges should be arriving next week). We are at Pinelands Primary School in Clarendon Road. Hope you are having a good week – Please can I get a large crate for Chloe? (I think that would be the right size for her?) I can do an eft before Saturday and bring along the proof of payment then. I am expecting a delivery of large crates on Friday so should have stock on Saturday. I need a crate for my German Shephered. He is 3 years old and rather big. Also he is new to me so I would like to train him he does have some training background but I would like to take him through it. Will you guys be able to assist me in this regard? Hi Julie, we have a 9 week old GSD puppy, would like to bring him for puppy classes ASAP. Are there fixed dates for these classes? Hi Friedrun – new pups join every Saturday so no specific starting days, no. Hi Julie, another question: would you know where I can hire a dog crate, one medium and one large? Many thanks for letting me know. I have a medium and an extra large for rental – the large is out of stock. 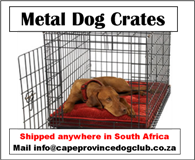 You can mail me info@capeprovincedogclub.co.za to arrange collection. Hope you are well.We bought a 6 weeks old Kerry Blue Terrier and she will be here next week Thursday.We would like to buy a crate but what size would you recommend? A large would be the right size for a Kerry Blue or even a medium could do. We have stock of both at the moment. I would suggest your pup stay with the breeder until 8 weeks to prevent behavioural problems particularly biting. Sorry Greg – we only stock the metal fold up crates which are not airline compliant. I am looking for a medium cage. If I came on Saturday with my money could I get one. Hi, I am getting a Labrador puppy mid February (8 weeks old.). Should I start out with a medium crate and then get an X large once puppy is growing and properly trained ? Please advise. A medium crate will last until your pup is about 5 months old, then you will need bigger. You will have to decide if the crate is just for initial house training or going to become his bed long term. If a longer term plan – then an XL would be better. You can make the floor space smaller with an old cardboard box – to start. Dear Sue i am adopting a cross GSD, Chow Husky from the SPCA this week. She is 5 months old and I would like to crate her as I have a very old maltese (17 yrs) who sleeps most of the day and I would not like the puppy to torment her. What size crate do u suggest I get? How much is it? Where can I get one asap? I live in Sea Point. Hi Michelle. I hope the crate is working for your pup. Anyone looking to buy a medium crate or do a swop? Contact the club and we can put you in touch with Jaqui. Hi, is the prices above for buying a crate or hiring one? The crate prices are to purchase. Rental is R500 (plus R500 deposit) irrespective of the size. If you only hire a crate for 3 or less days, will it still cost R500? Yes the rental is the same irrespective of the number of days. Hi, flying to Windhoek in January. Need a cage for my Sharpei. He weighs 25kg. Pls can you show me in the right direction. If I can hire it will be great. Sorry Annalize – my crates are not suitable for airline travel. Perhaps Pet travel can help you? Sorry Annelize, our crates are not airline approved. Please advise what size crate I will need for my Bullterrier? The crates fold up flat (very easily)so are very easy to take in and out of the car.